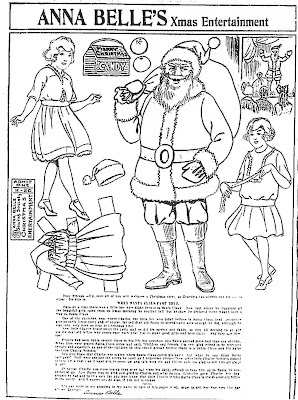 December 28, 1900. Peter is ready to party. This illustration is by the great cat artist, Louis Wain. 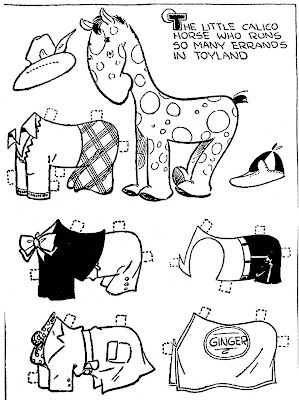 From a London newspaper. 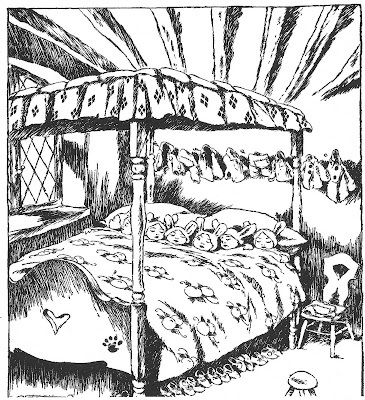 Lewis, King of the Castle. 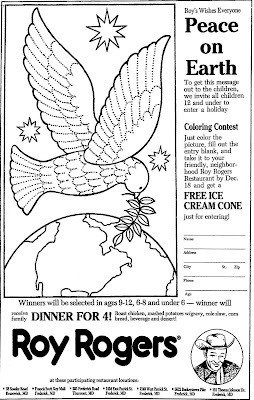 Nolan Rogers Spencer Farr-Farr, our oldest jolly bird. 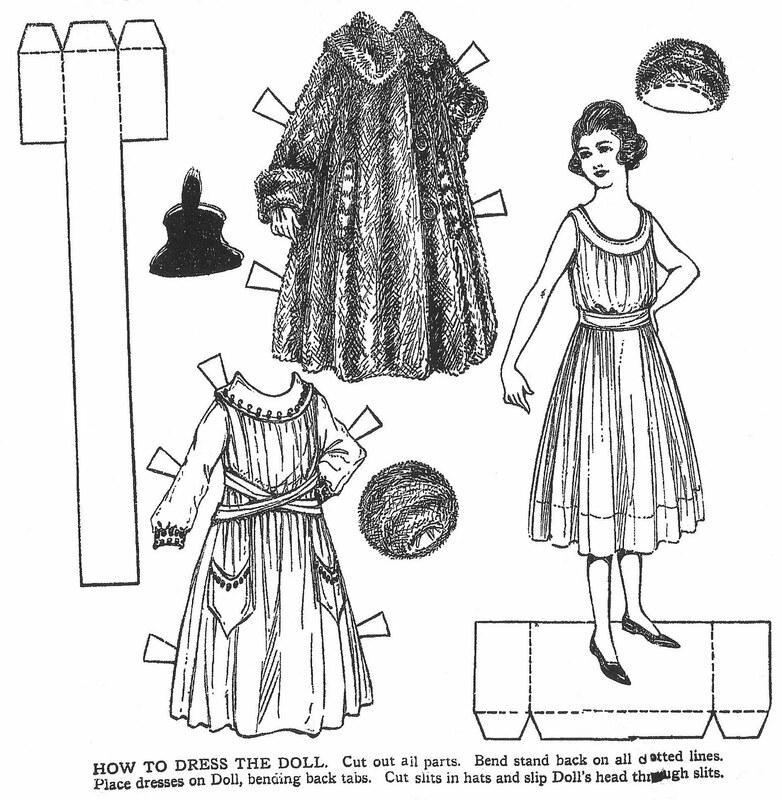 A lovely bouquet - Daisy, Rose and Violet, the three sisters. 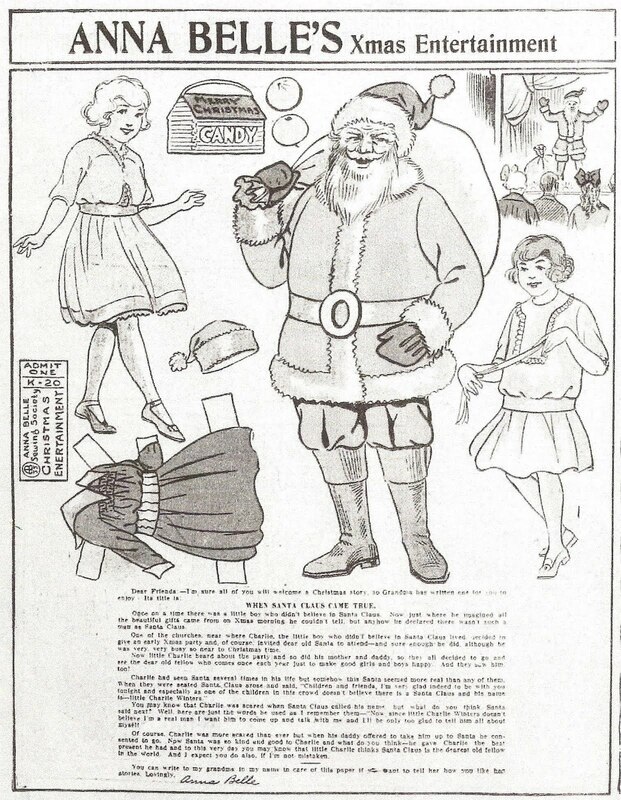 December 1933. 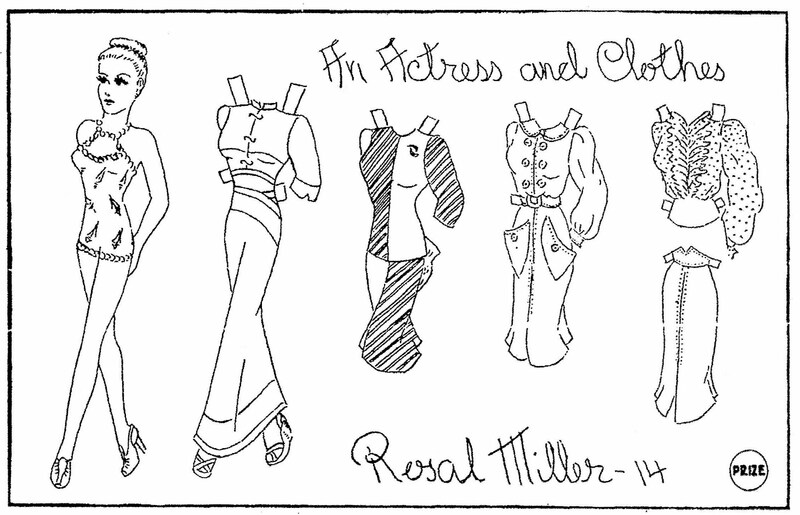 From the comic strip "Girls" by Edgar Martin. "Girls" featured Boots, Babe, Nan, Cora, Stephen (the Professor), Spence and Horace, all college chums. 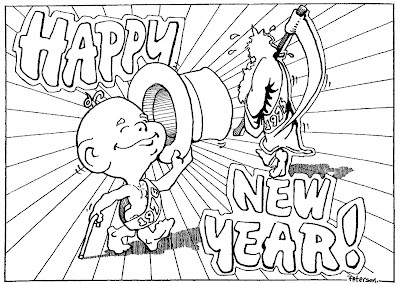 Many thanks to Edgar Martin. 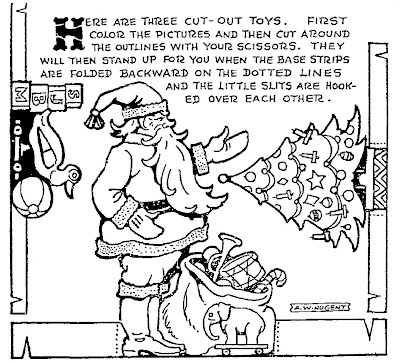 December 30, 1916. From the ANNA BELLE newspaper paper doll series. 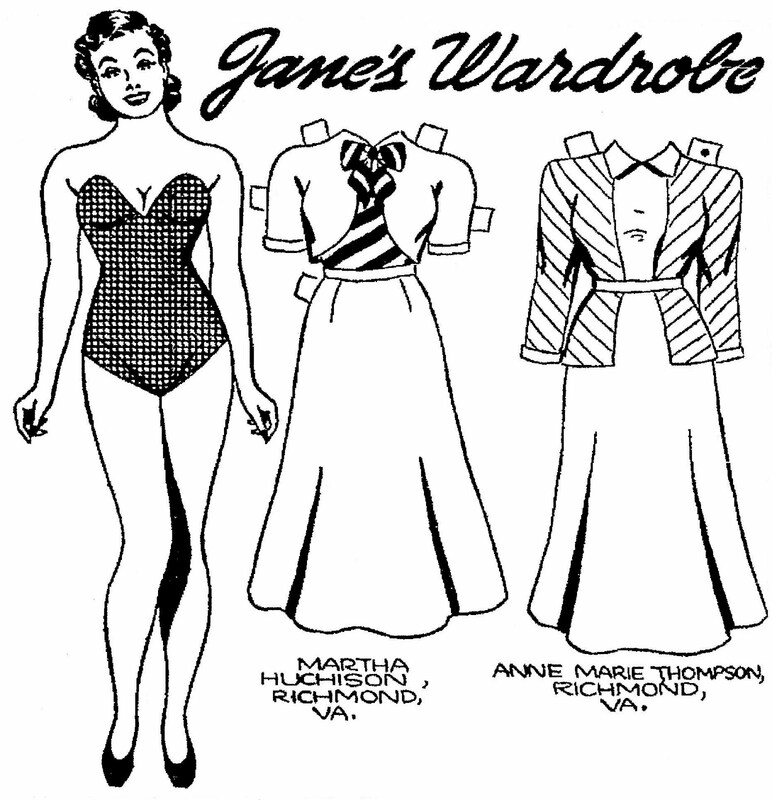 July 25, 1937. 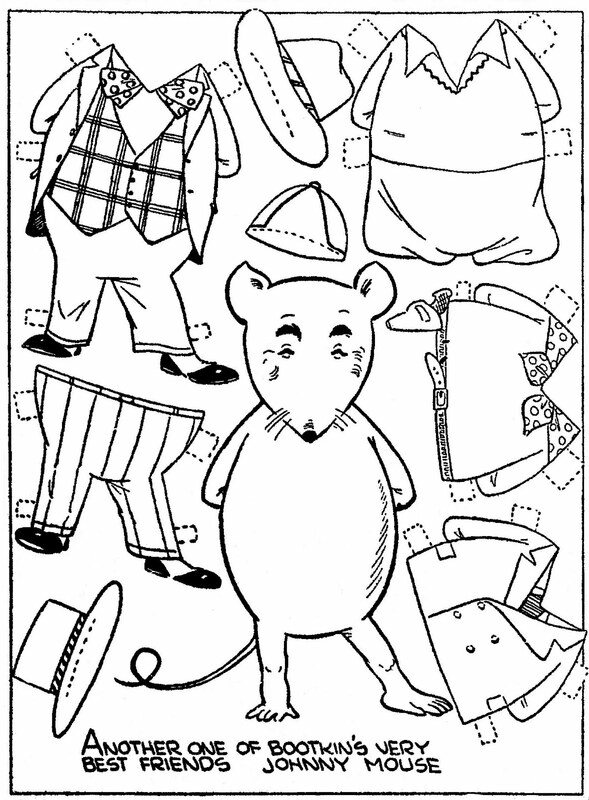 "Another one of Bootkins' very best friends, Johnny Mouse." 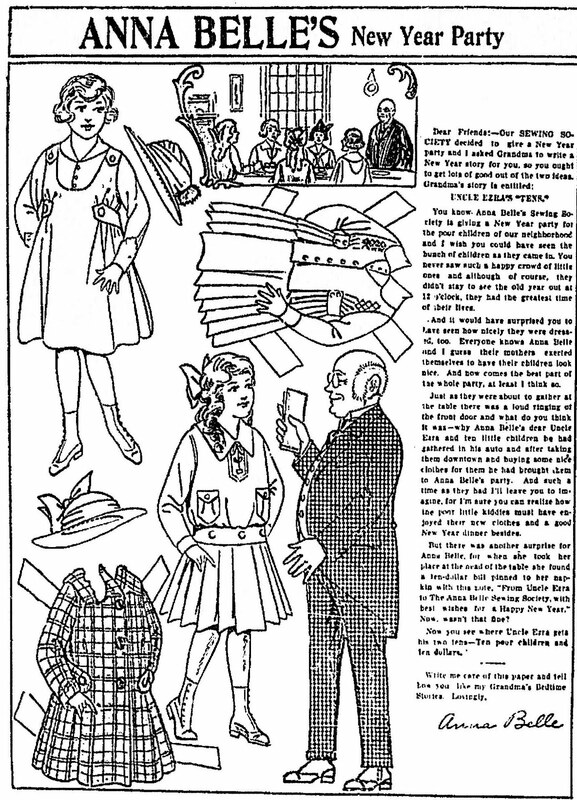 July 18, 1937. 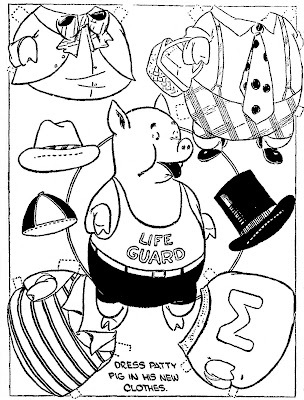 "Dress Patty Pig in his new clothes." 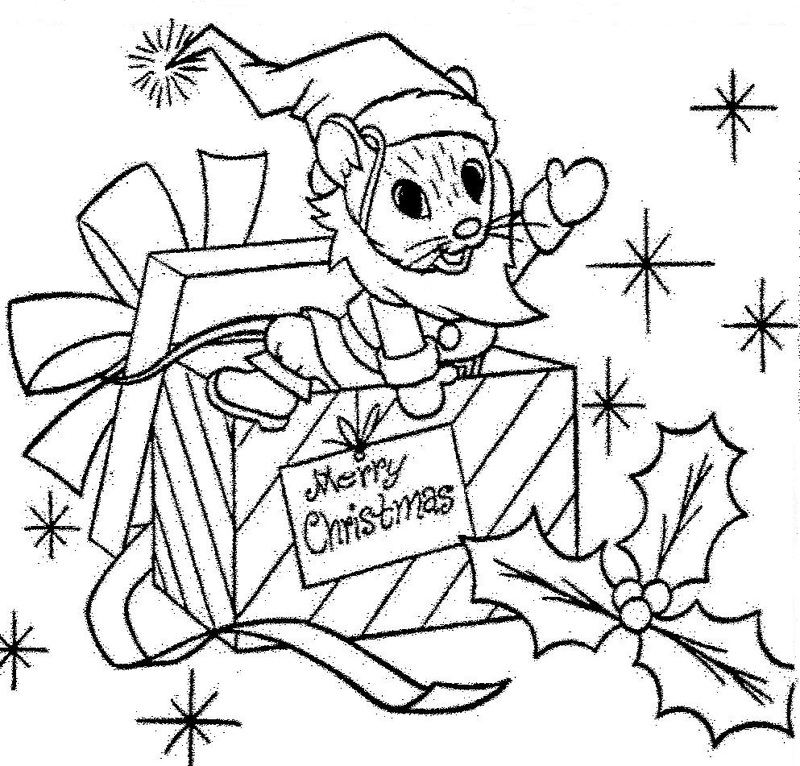 Many thanks to Edgar Martin. 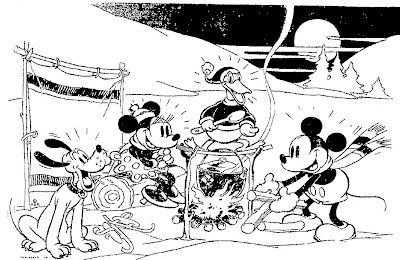 January 05, 1941. 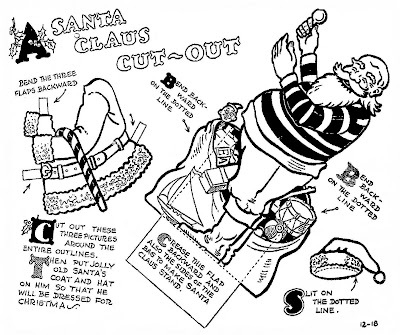 A snowman paper doll that looks alot like Boots' friend, Ferd. 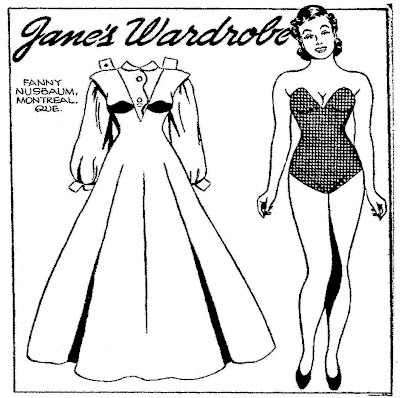 August 08, 1937. 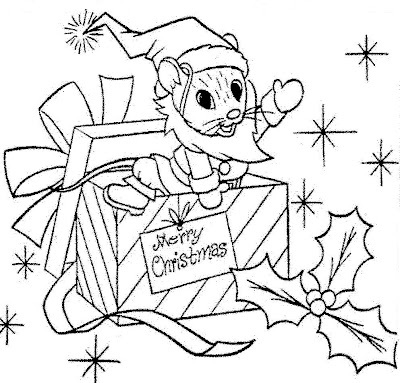 "This is the little elf who gets into so much mischief." 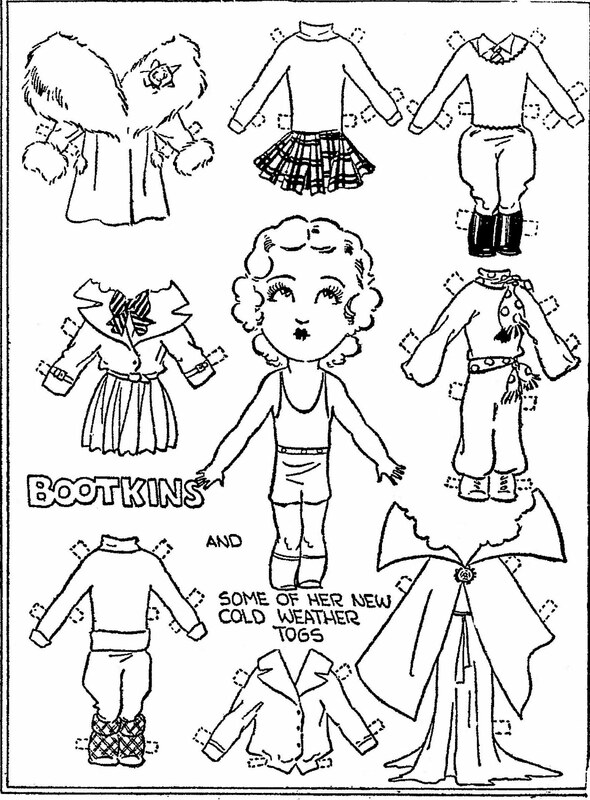 Here is Bootkins' friend as a paper doll. 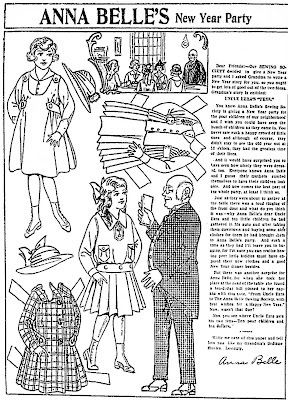 August 15, 1937. 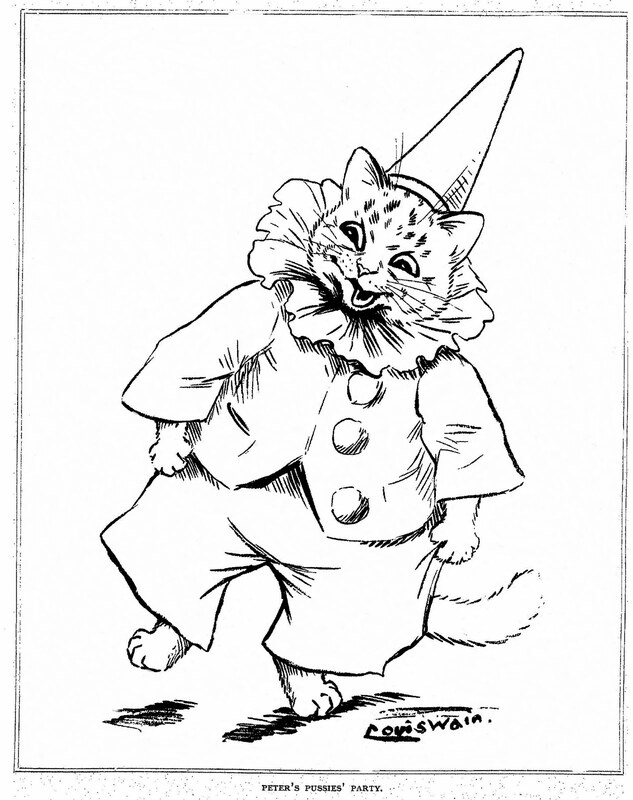 "The little calico horse who runs so many errands in Toyland." 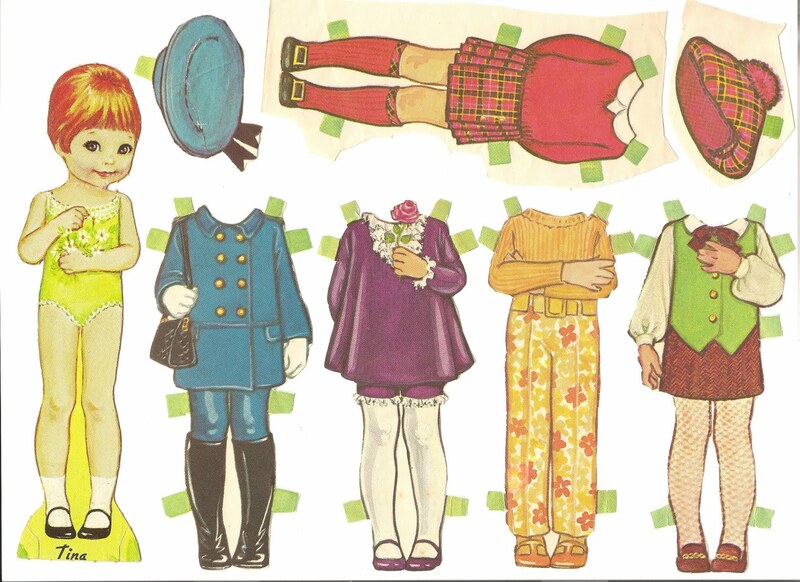 Here is Bootkins friend, Ginger the Calico Horse, as a paper doll. 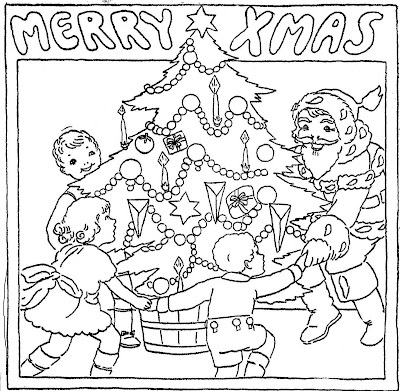 Many thanks to Edgar Martin. 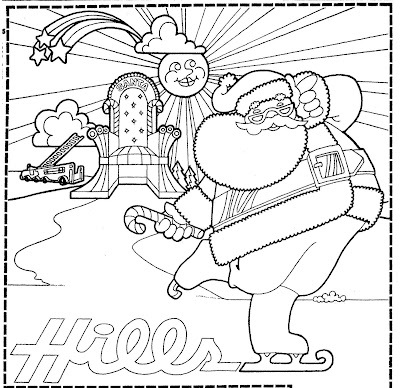 December 05, 1971. 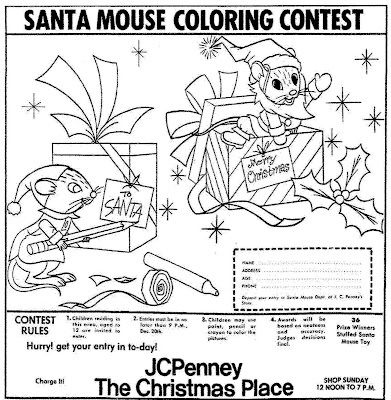 Winners of this JC Penney Christmas coloring contest received a stuffed Santa Mouse toy. 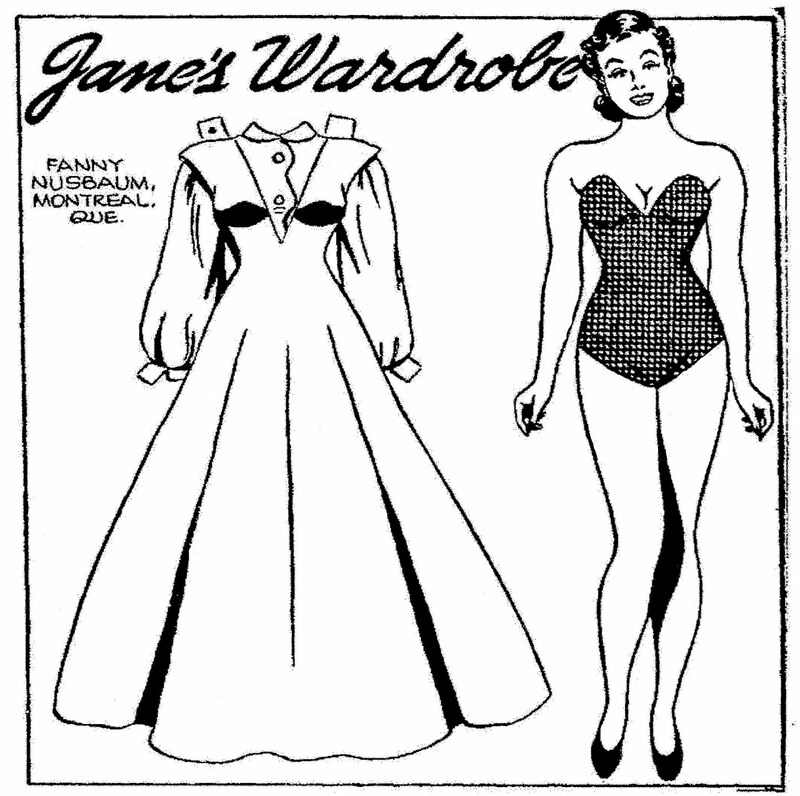 June 25, 1950. 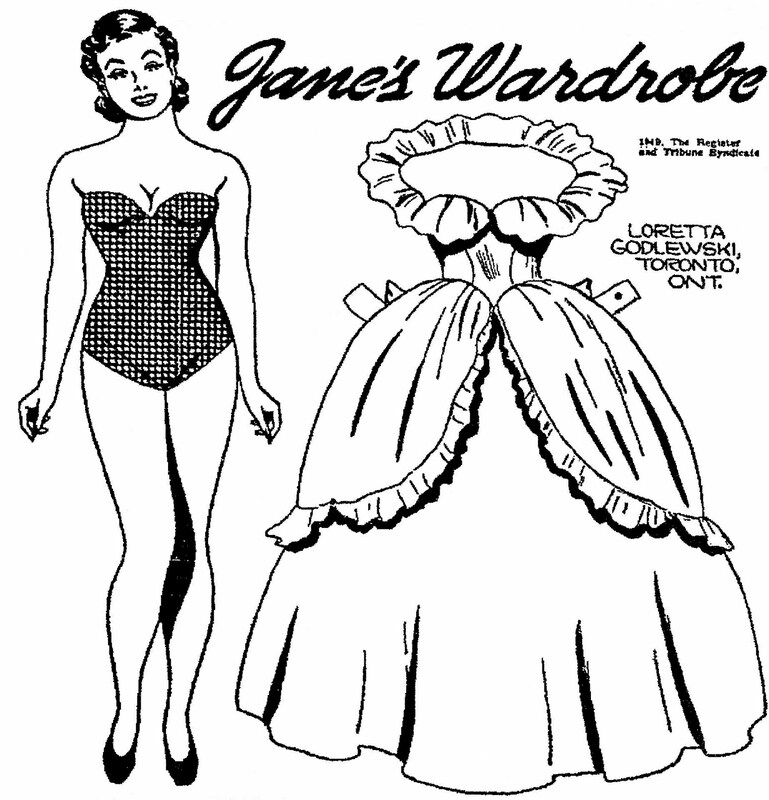 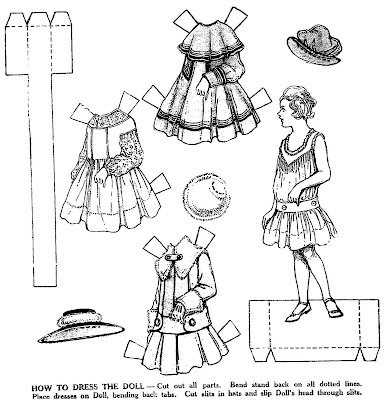 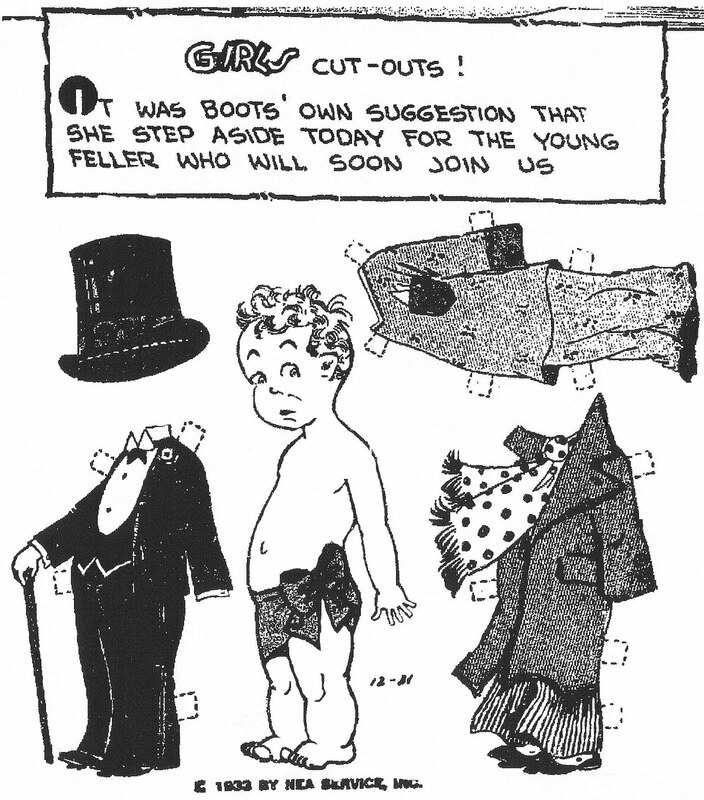 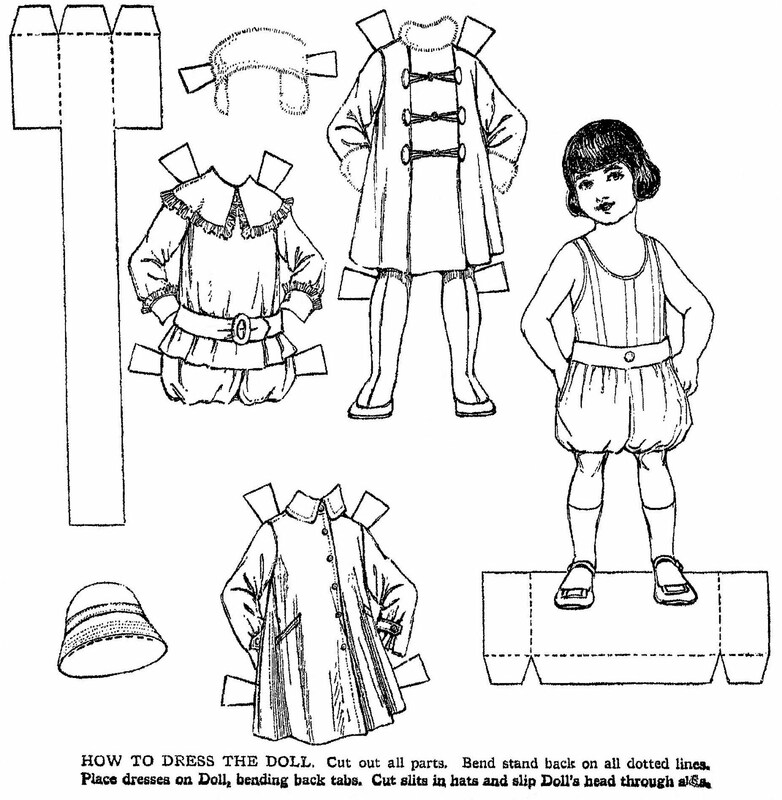 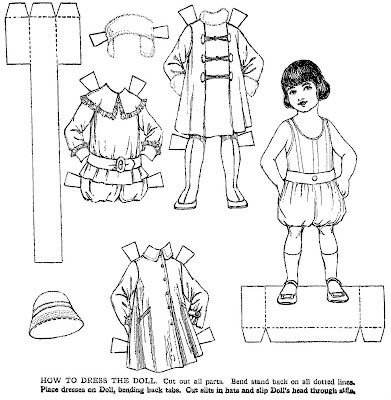 A paper doll from the TILLIE THE TOILER comic strip. 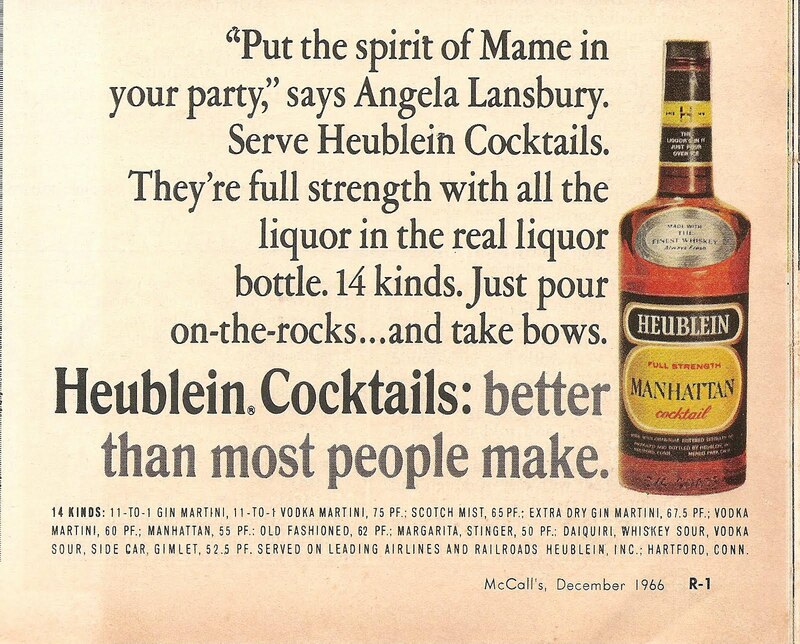 "Put the spirit of Mame in your party," says Angela Lansbury. 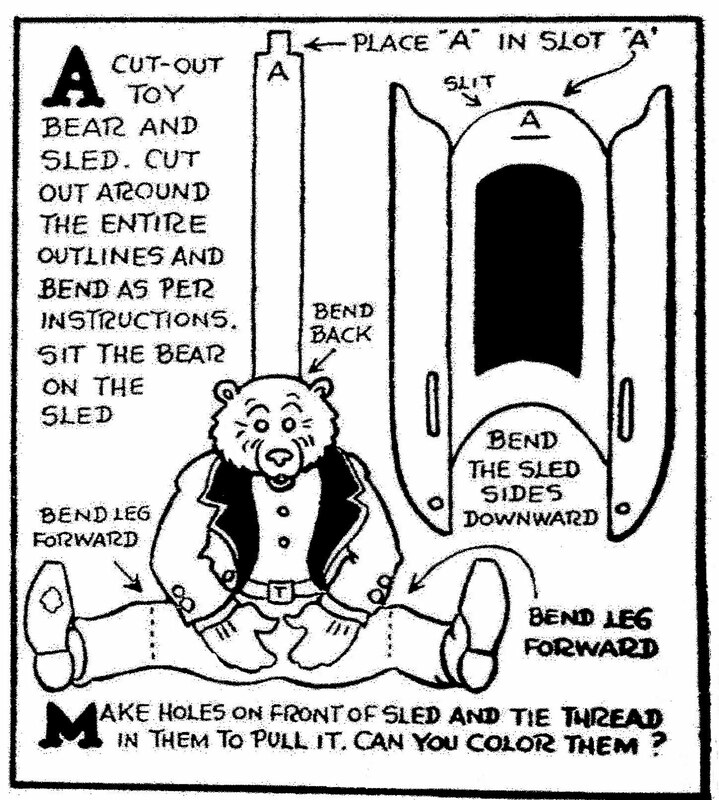 McCall's Magazine, December 1966. 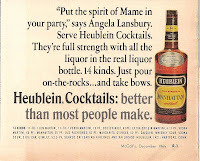 "Mame", smash musical hit, stars Angela Lansbury, the new toast of Broadway. 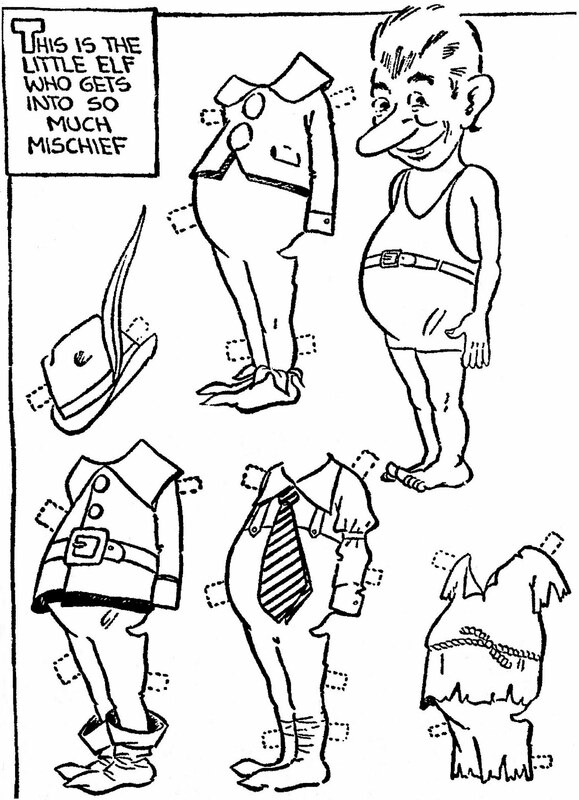 June 15, 1972. 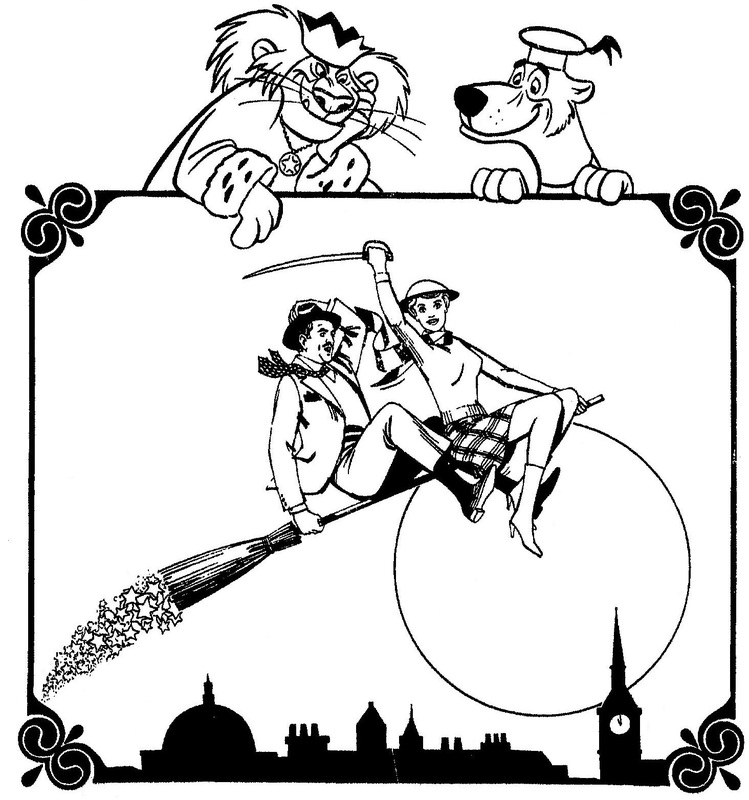 The Walt Disney movie "BEDKNOBS AND BROOMSTICKS" starred Angela Lansbury, David Tomlinson, Roddy McDowall, Sam Jaffe, Roy Snart, Cindy O'Callaghan and Ian Weighill. Directed by Robert Stevenson with animated cartoon sequences directed by Ward Kimball. 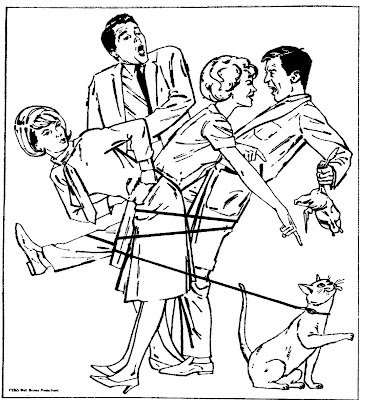 The movie won an Academy Award for Special Effects. 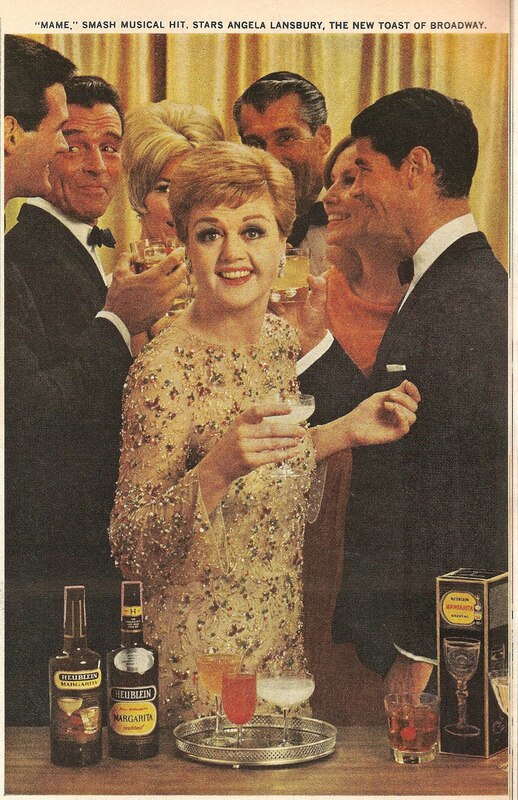 Angela Lansbury played an amateur witch who helped the British cause during WW2. 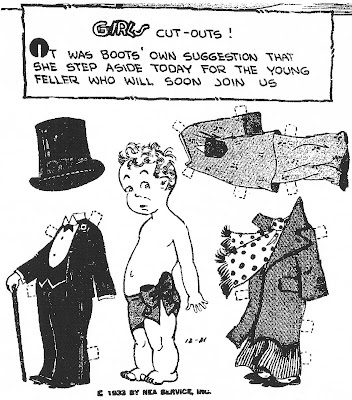 November 28, 1935. 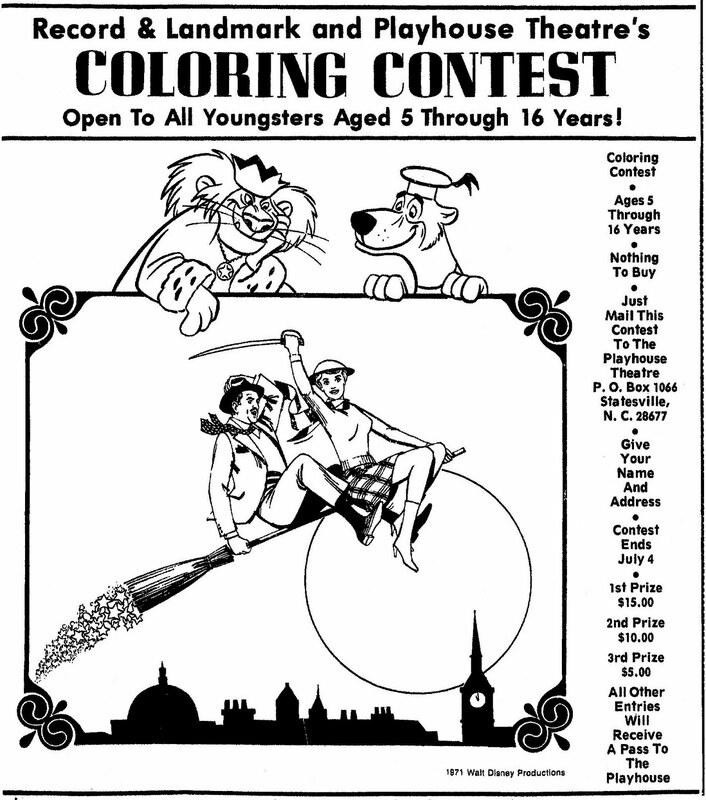 "Hey, Kiddies! 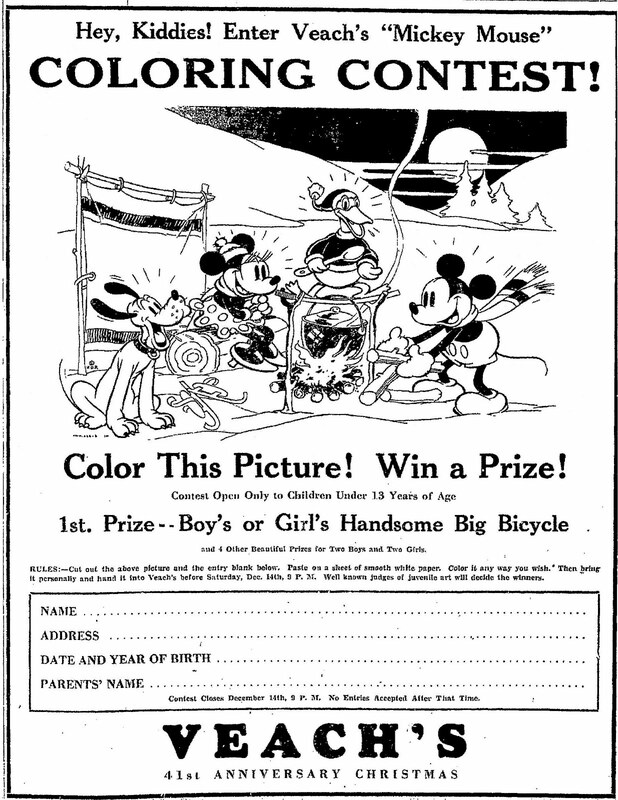 Enter Veach's MICKEY MOUSE Coloring Contest!" 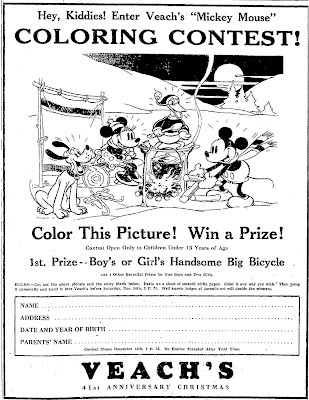 This early Mickey, Minnie, Pluto and weird-looking Donald, Christmas coloring contest appeared in a Pennsylvanian newspaper to celebrate the 41st Anniversary of VEACH'S. 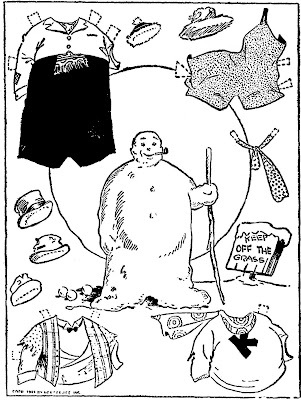 December 23, 1928. 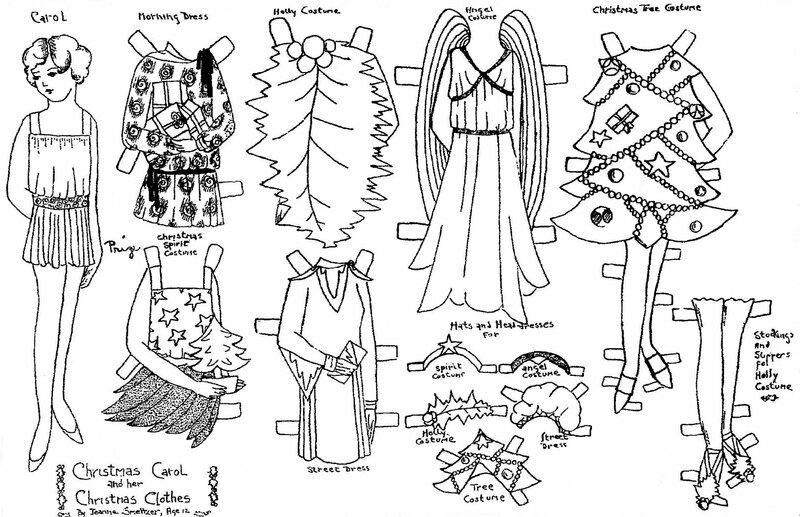 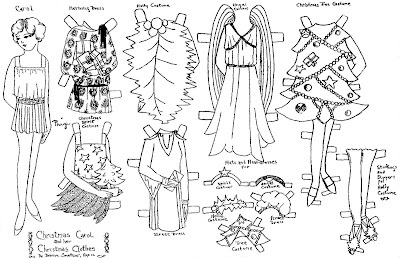 CHRISTMAS CAROL and HER CHRISTMAS CLOTHES by Jeanne Smeltzer, age 12. 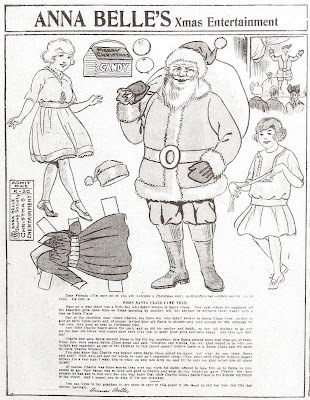 December 27, 1931. 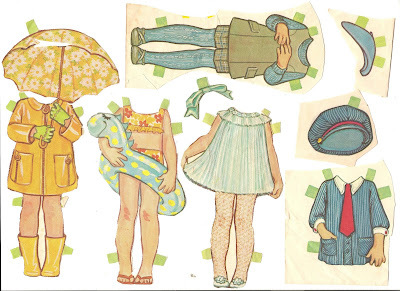 DOT the paper doll by Virginia Cortez, age 15. April 28, 1946. 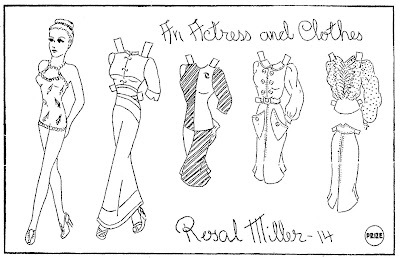 A paper doll by Rosal Miller, age 14, an Aunt Elsie Club Member. 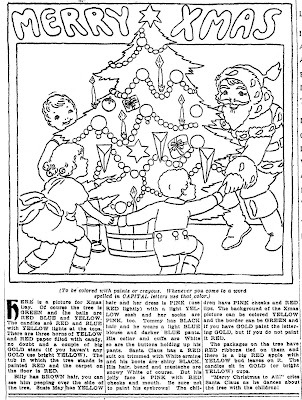 December 25, 1932. 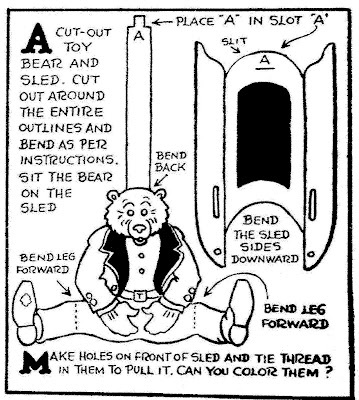 A cut-out toy bear and sled. 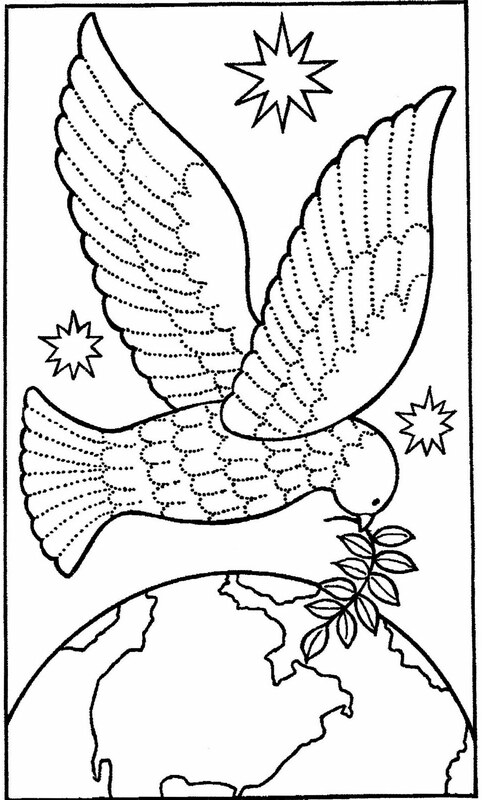 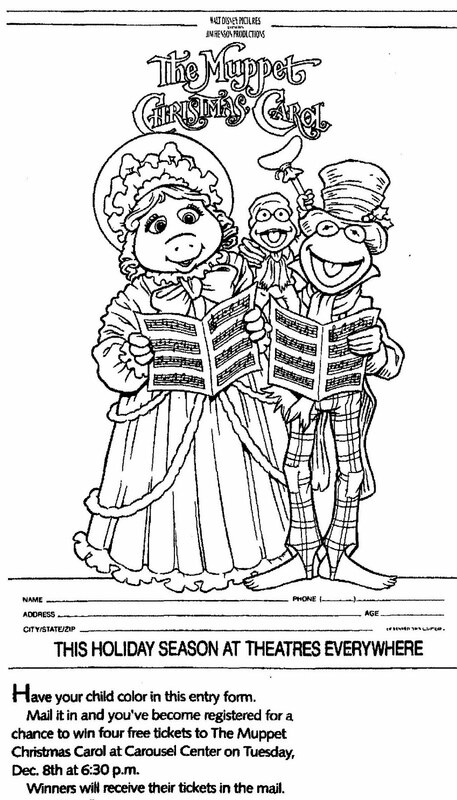 Can you color them? 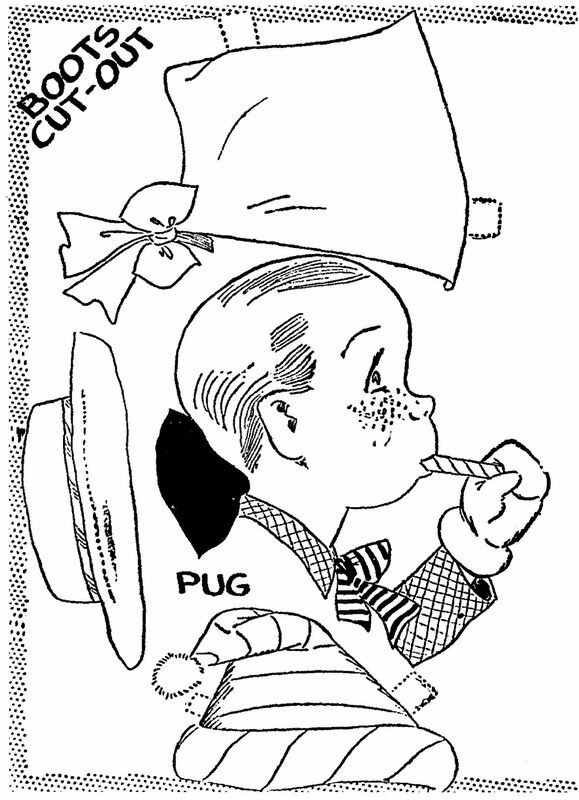 A. W. Nugent. 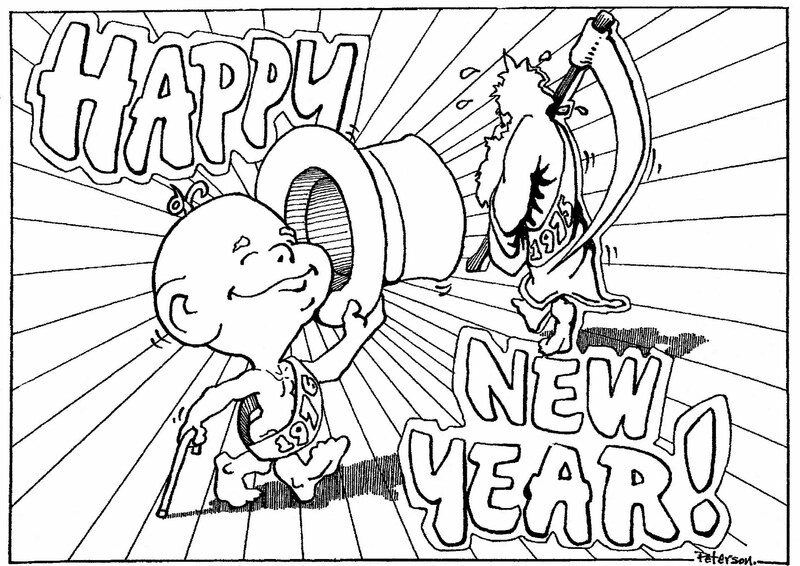 December 08, 1992. 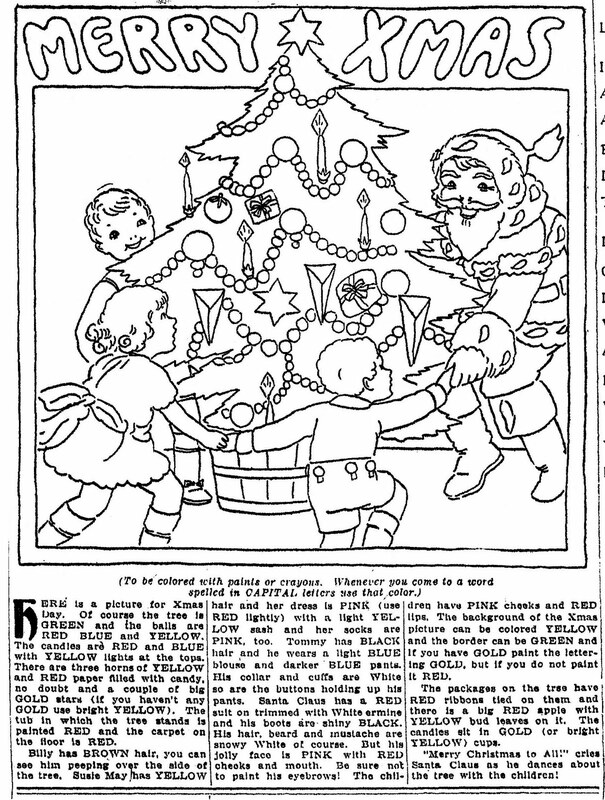 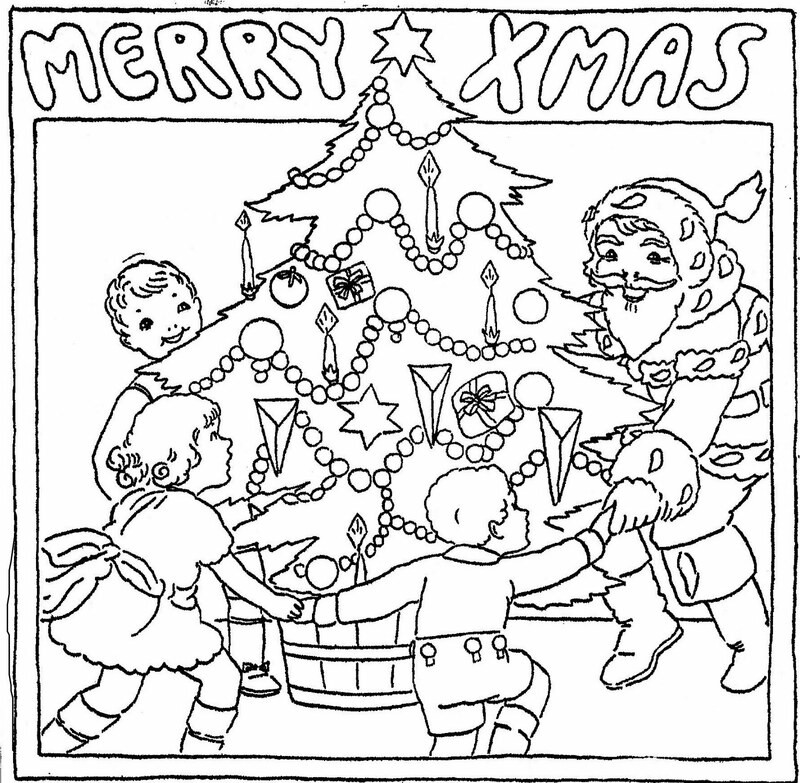 A Christmas Coloring Contest from ROY ROGERS' Restaurants that appeared in various newspapers. 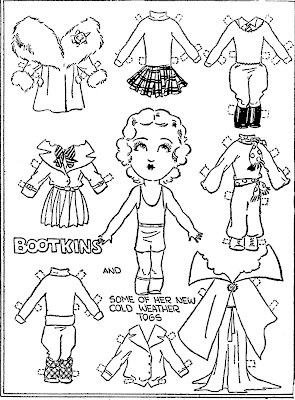 Roy Rogers and Dale Evans have always been a part of my life because of how much my mom has always loved them. Happy Trails to everyone! 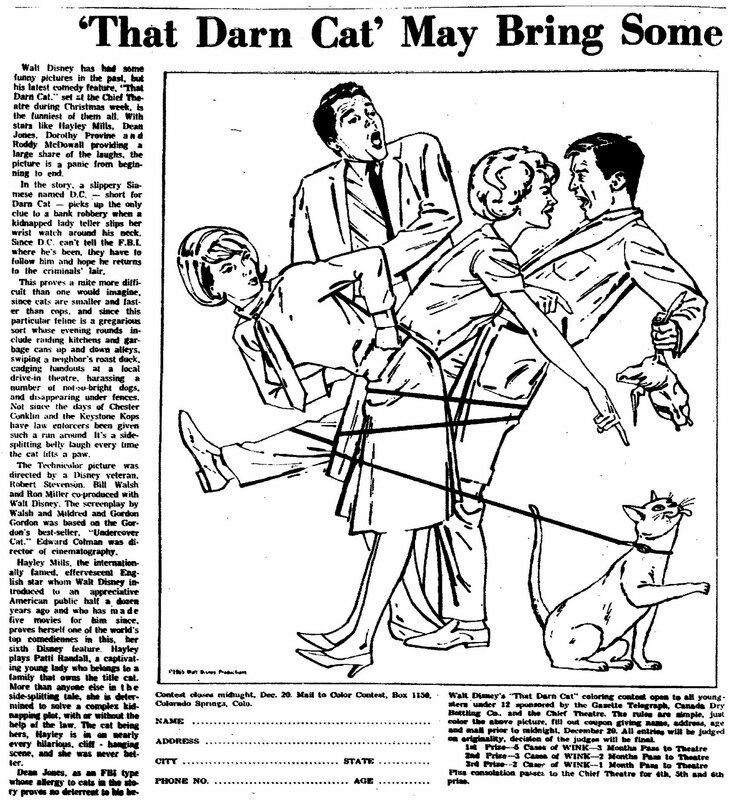 December 11, 1965. 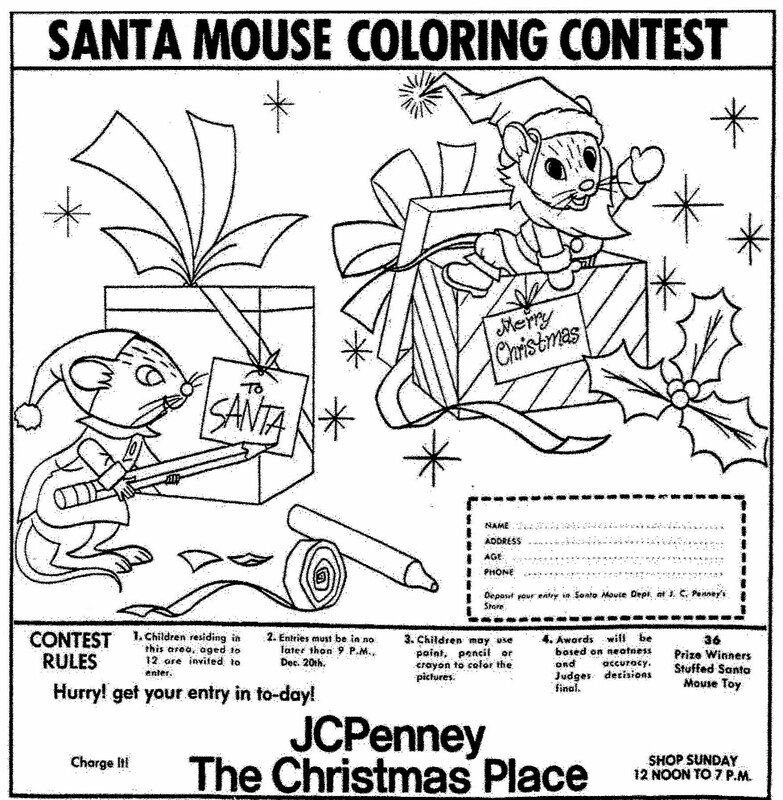 Finally, I found a coloring contest for THAT DARN CAT! 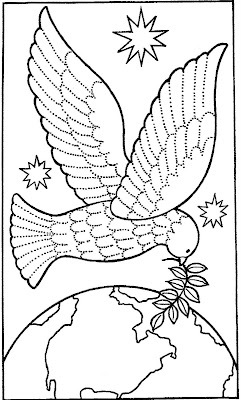 I knew there had to be one somewhere. 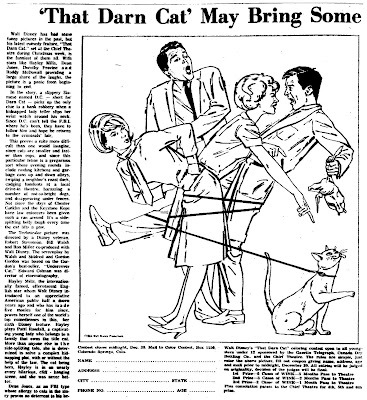 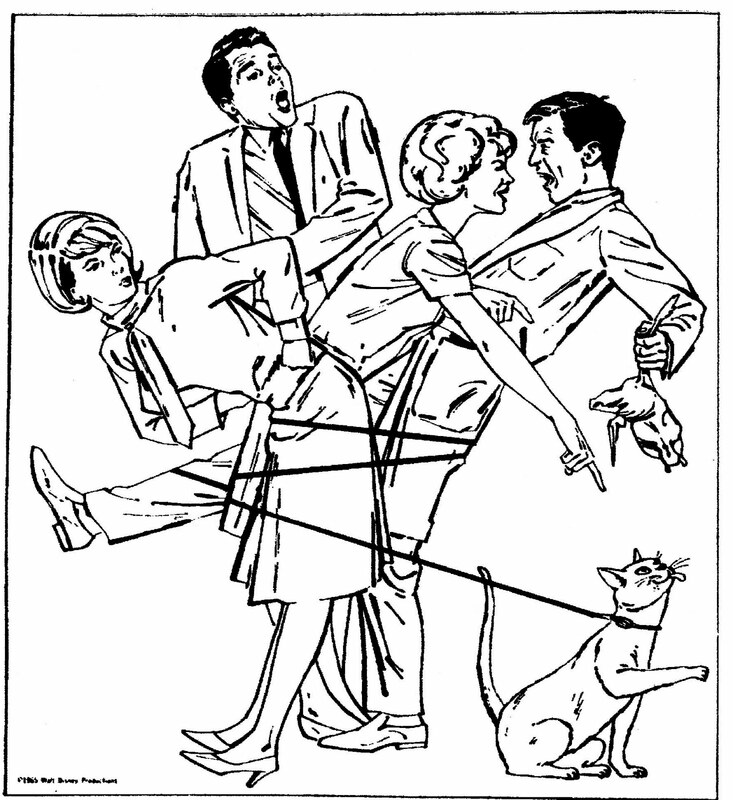 The movie starred Hayley Mills, Dean Jones, Dorothy Provine, Roddy McDowall, Neville Brand, Elsa Lanchester, William Demarest, Frank Gorshin, Ed Wynn and of course, D. C., That Da** Cat. This Walt Disney picture was directed by Robert Stevenson. 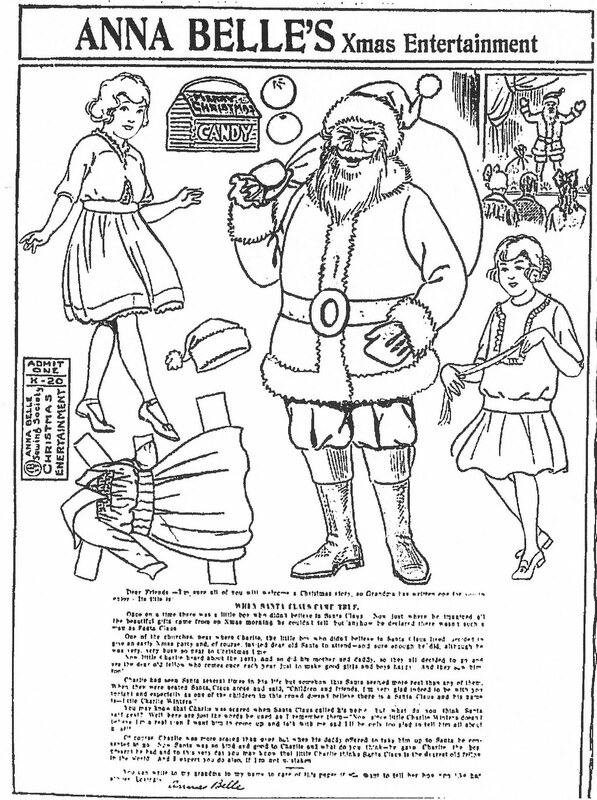 December 16, 1916. Two different versions of the same ANNA BELLE. 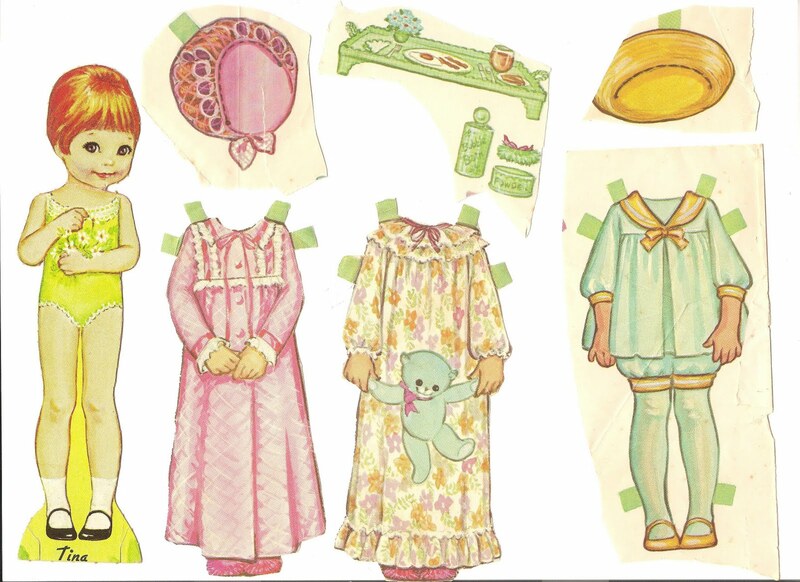 November 26, 1975. 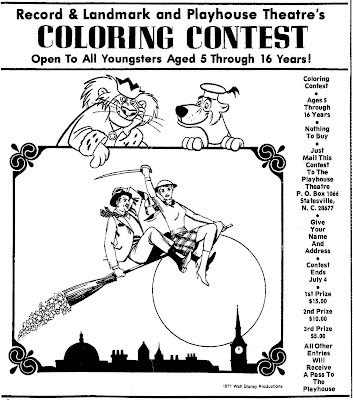 Newspaper coloring contest. Whitman #1952, price .29 cents, TINA AND TRUDY Cut-Out Dolls, 1967, by Kathy Lawrence. 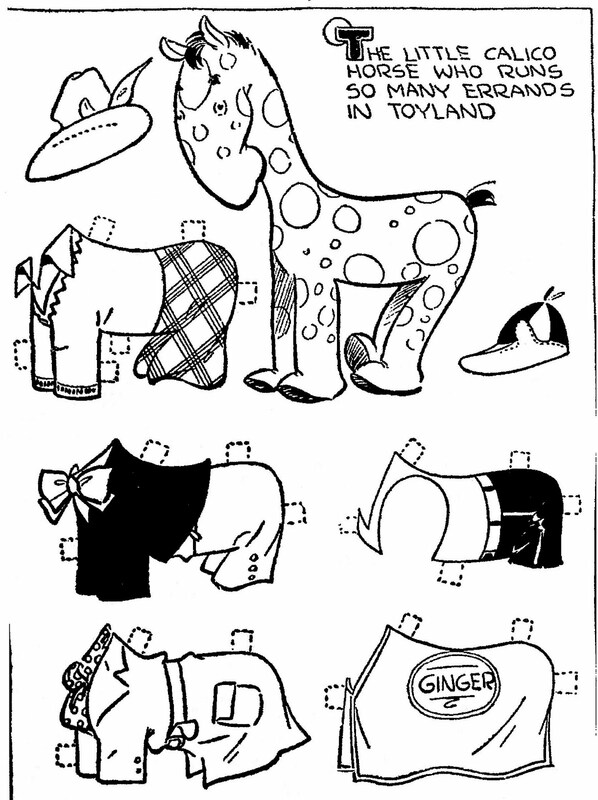 Trudy and the two poodles must have joined the circus because I have not been able to find them. This was one of my earliest paper doll books and a very cute one at that. 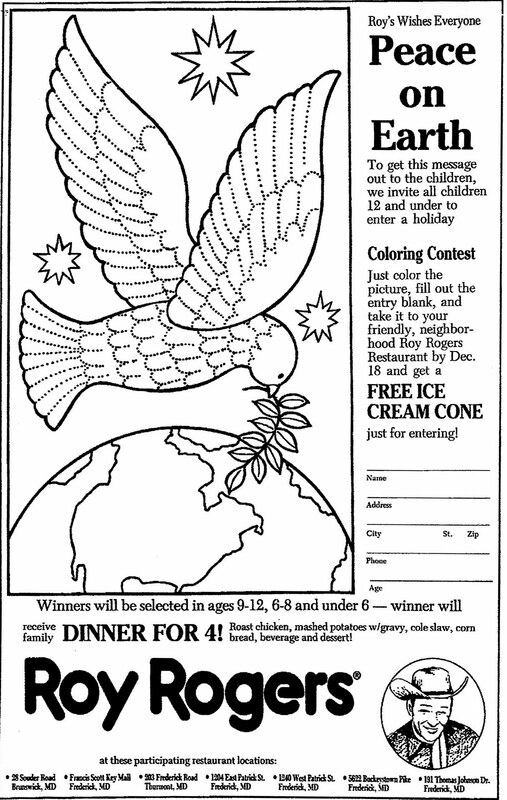 November 30, 1992. 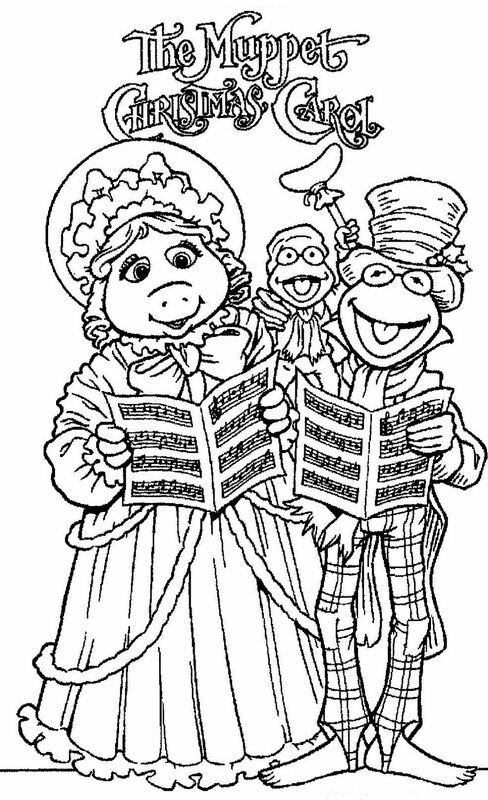 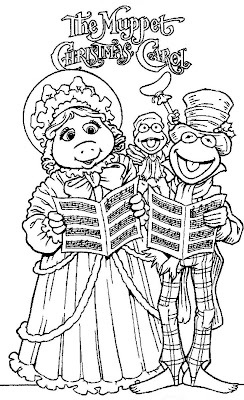 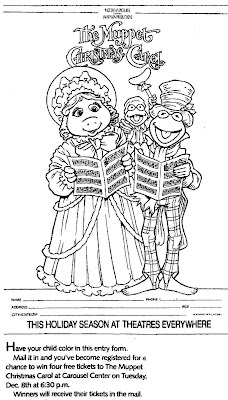 A cute newspaper coloring contest to win tickets to the movie "THE MUPPET CHRISTMAS CAROL". 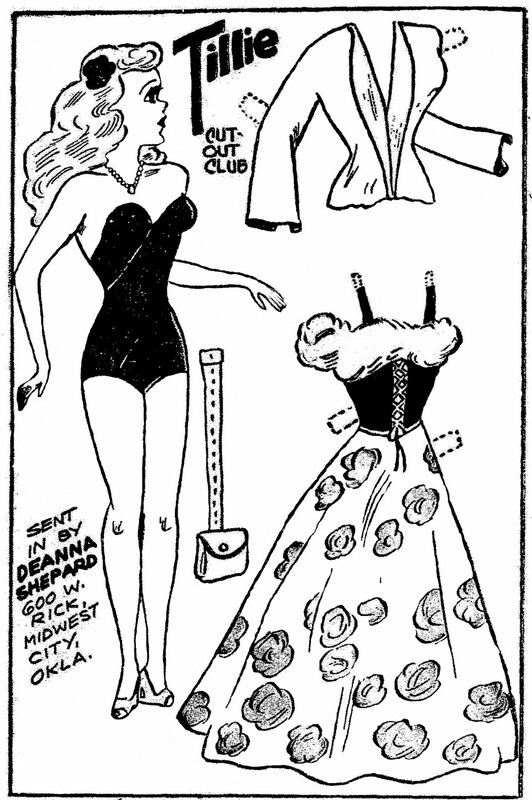 November 29, 1936. 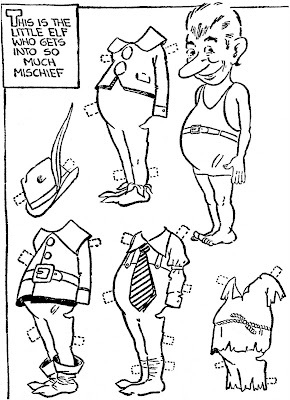 Many thanks to Edgar Martin. 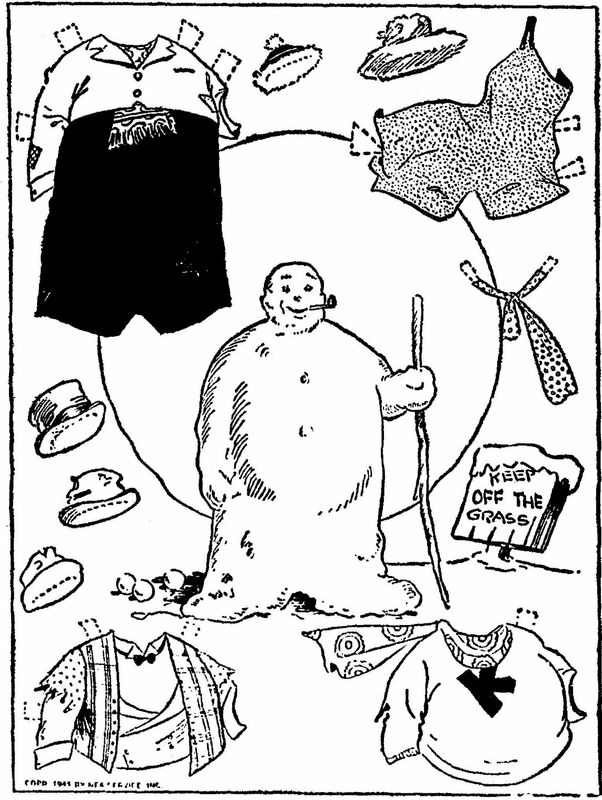 December 02, 1923. 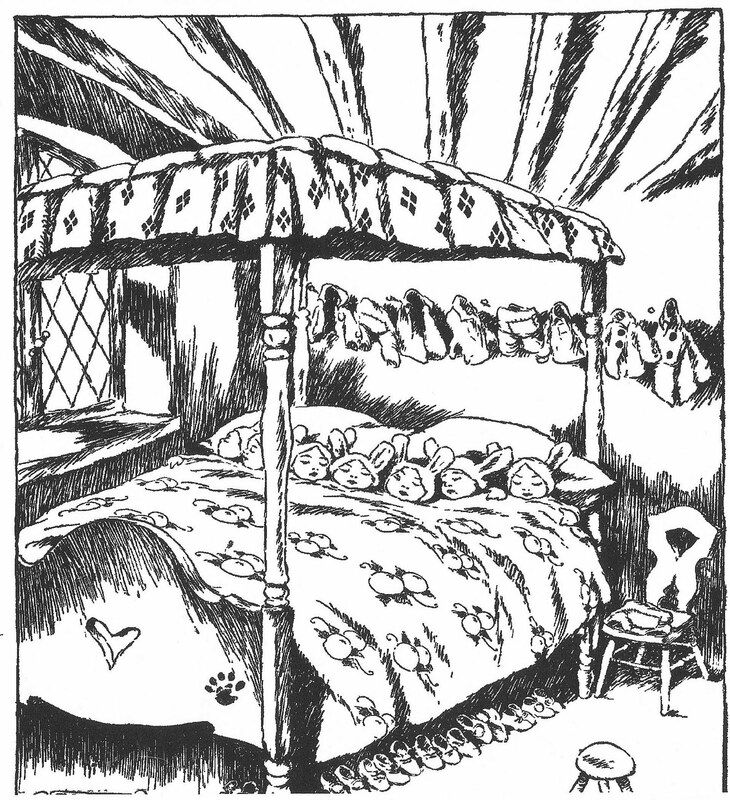 Jackets hanging on their pegs and little shoes in a row beside the bed - I LIKE!! 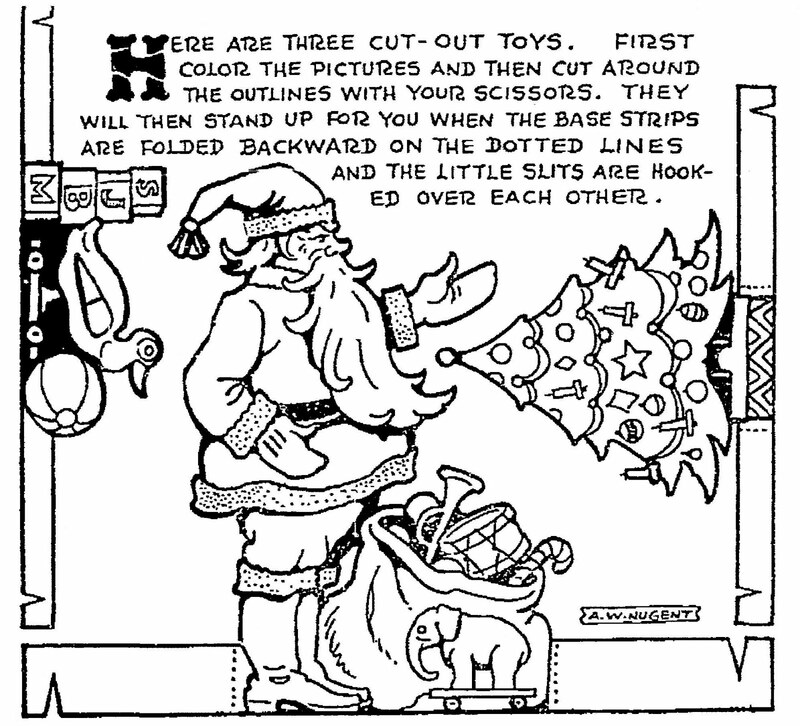 December 16, 1934. 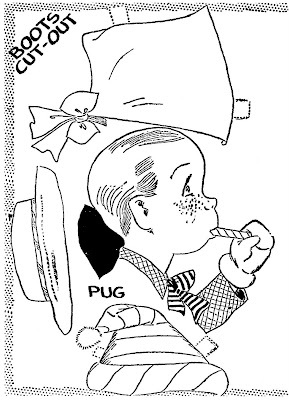 Have a Merry Christmas with A. W. Nugent.